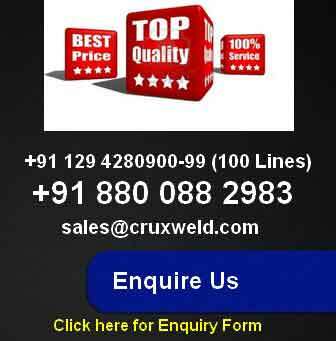 CRUXWELD has specialization in MIG Welding Machine and have a range like 250 Ampere, 400 Ampere and 600 Ampere. Our welding equipment is precisely manufactured by using the best quality raw material and entire range is checked & tested on national and international parameters of quality using latest testing equipments under the supervision of quality expert. 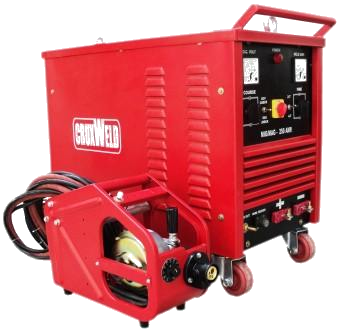 Our hi-tech Mig Welding Machines is best for heavy duty job and very efficient with low cost. Excellent VI characteristics for overall current range. Two track & four track option for continuous welding purpose. Smooth, spatter free and noiseless CO2 Welding Machine. Power source suitably designed for short arc length with mig wire sizes from 0.8 mm, 1.2 mm, 1.6 mm and 2.4 mm. Forced air cooling system for raise unit life. Transformer protection against thermal overload. Compact & light weight wire feeder design for continuous welding. Perfectly manufactured to work in extreme Indian environment and terrain work conditions.